Ergonomic Task Chairs: What Are They & How To Choose One? Have you ever stopped to think about how much time you sit in a chair while at work? The average person sits in their office chair six to eight hours a day, which is a significant part of their workday. With that in perspective, shouldn’t you choose a chair that provides both long-lasting comfort and excellent support? 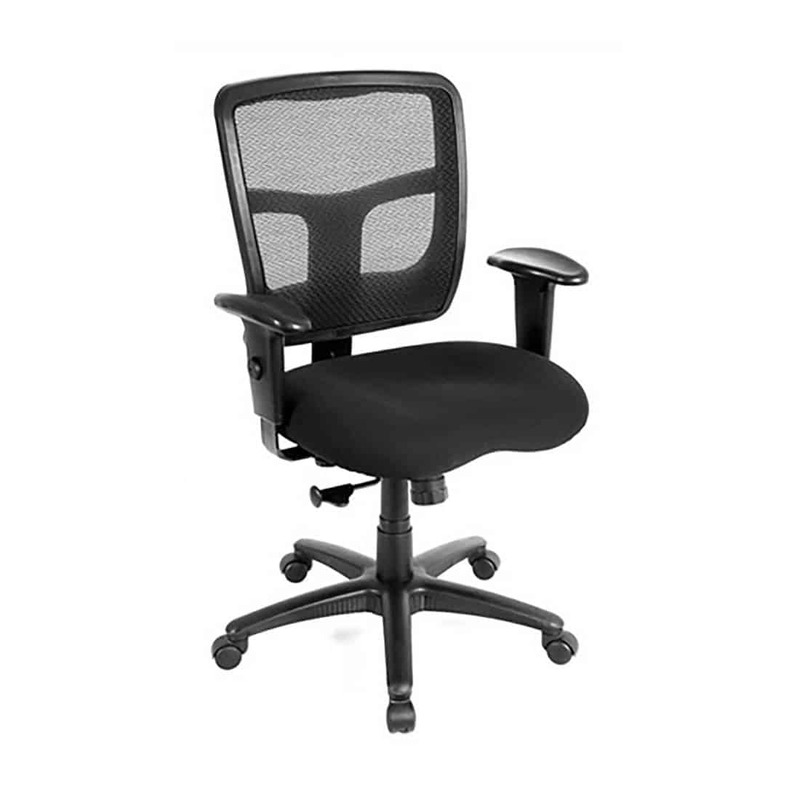 Ergonomic task chairs are designed with the body’s proportions and natural curvature in mind so that a user can be comfortable and well-supported throughout the workday. However, everyone is proportioned differently, so how can you find one chair that fits multiple people’s needs? Understanding the features described below will allow you to make informed decisions about the flexibility, comfort, and longevity of your office chair purchases. These features enable the chair to adapt to the myriad size and proportions of each person who uses it throughout the day, but how do you know you’re getting a good quality chair? Knowing the features your chair should have is a good place to start, but now we’ll dive a bit deeper into what makes these features important, as well as the makeup of the chair itself. The first feature you should look for is Back Height Adjustment. This feature allows the user to raise or lower the seat back so that it best supports the lumbar (lower) region of your spine. Supporting your spine’s natural curvature is the single most important feature an ergonomic chair should have. The back of the chair should follow the natural lumbar curve and be firmly but not overly padded. You should also avoid chairs with protruding curves that push your back out unnaturally. Your lower and mid-back should have the most support, so a high back chair is not required. Some people do prefer high back chairs which is perfectly fine as long as they have the necessary lumbar support. The next thing to look for in your ergonomic chair is Adjustable Tilt Tension, a feature that allows you to lean back in your chair without tilting too far back. When searching for this feature you should avoid permanent contact backs, as they can often feel as if they are pushing you forward due to tight tension. Instead, look for a chair that allows you to set the tension to your body’s size and weight. This will maximize comfort and allow the user to move freely in their chair. Another useful ergonomic feature is Adjustable Arm Height. This is a simple feature that allows the user to raise or lower the arms of the chair so that they can rest their arms at a 90 degree angle with their wrists flat on the work surface. When looking for this feature, avoid ratchet adjusters because they often do not hold up against continuous use. Now let’s look at the seat of your chair. The most obvious place to start would be the width of the seat itself. You will want to make sure it is not constricting, but also not too large that the arm rests are unreachable. The general rule of thumb is to have a spare inch on either side while sitting. You should also pay close attention to the weight rating of the chair’s Pneumatic Seat Height Adjustment (a feature that allows easy raising and lowering of the chair height), helping you determine the usability of the chair by everyone in your office space. Another important feature for different-height users is an Adjustable Seat Pan. This feature allows users to make the seat longer or shorter to accommodate different upper leg lengths. Lastly, take a look at the cushioning and upholstery on the chair. The seat should be firm with a durable material that is breathable or allows air to flow freely through it. The last thing to look at is the base of your chair. Most likely you will be looking at what is known as a five-star swivel base, which is standard on most modern ergonomic chairs. These come in a variety of finishes including plastic, metal, and wood. Avoid the cheaper plastic base models as they are prone to snapping castors. Better-quality plastic bases will have reinforcements underneath the chair. Metal bases are usually made from either aluminum or steel. Aluminum is an excellent base material; it is lightweight and durable, and comes in a variety of finishes. Steel is the most common base material because of its durability, but it is a little heavier than aluminum. Wood bases are great if you prefer a more home-like feeling in your office space; however they tend not to be very durable. To ensure the longevity of your chair, I also suggest looking at its warranty. A chair with at least a five-year warranty is usually a safe bet. As far as pricing is concerned; if you think about sitting in a chair six hours a day, thirty hours a week, and one thousand five hundred hours a year, consider that an average priced chair of $239.00 would cost you about $.65 per day over a year’s time. Isn’t your comfort worth a $.65/day investment?